Sometimes you just have to make a cake. You do. It’s a fact. There’s something therapeutic about measuring, stirring and mixing to create sweet goodness out of simple ingredients. This recipe for Praline Cake Squares is one I’ve had marked in my Aunt’s cookbook for a while now. I don’t have any idea where it came from, but sure wish I did because I’d send them a thank you note. Good? It was mighty good, with a light texture, the perfect amount of sweetness, and a delicious praline type topping. 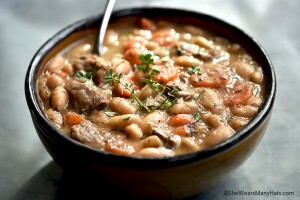 This recipe is on my keeper list for sure. 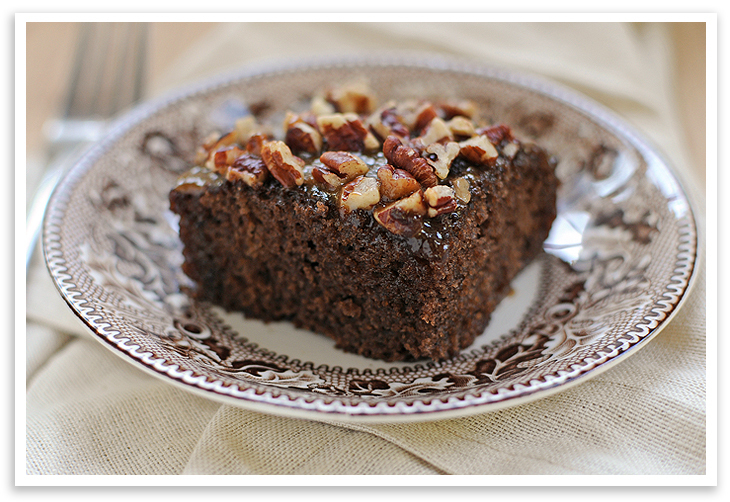 Let me put it this way, if I had a restaurant, Praline Cake Squares would be on the dessert menu. The process is simple. Mix up a buttermilk cake batter and bake until done. While the cake is baking make the icing. Dark brown sugar makes this icing/topping. The icing will have little pieces of butter in the mixture. That’s okay. Once you pour it on the baked cake, the butter begins to melt right in. Pour the icing on the warm, baked cake, and spread evenly. Top with pecans. I covered only half of the top with pecans, because my kids don’t care for nuts. Pop it back in the oven, under the broiler until it bubbles. Cut into squares and serve. It’s something else while it’s still warm. Look at that goodness in the bottom of the pan. Give this one a try soon for your next get together, and watch it disappear fast. Preheat oven to 350-degrees F. Grease and flour 13x9x2-inch baking/cake pan. In a saucepan, heat the buttermilk and butter, until butter melts. Transfer to a mixing bowl. Add the brown sugar, eggs and vanilla, and beat together. Whisk together the dry ingredients; flour, baking soda, cocoa powder. 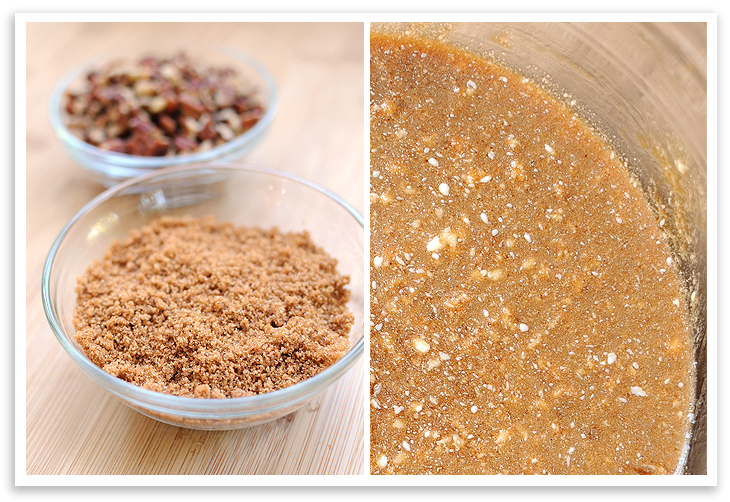 Gradually add the dry ingredients into the wet mixture. Mix until just incorporated. Don't over mix. 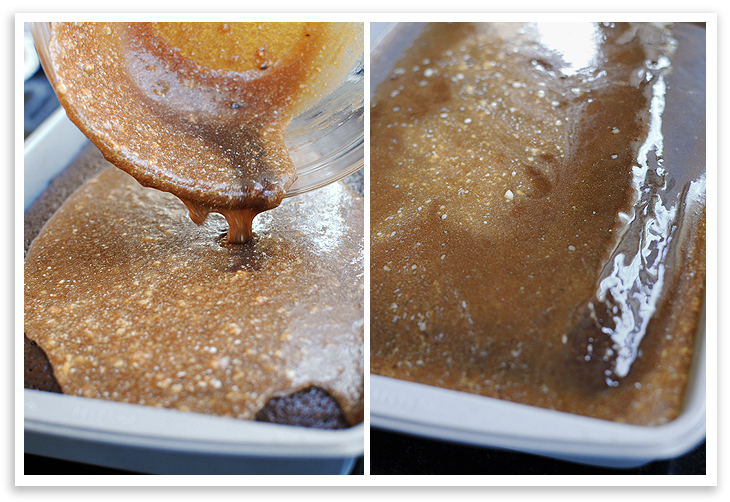 Pour into greased and floured 13x9x2-inch baking/cake pan. Bake at 350-degrees F for about 20-25, until cake tester or toothpick comes out clean from center of cake. 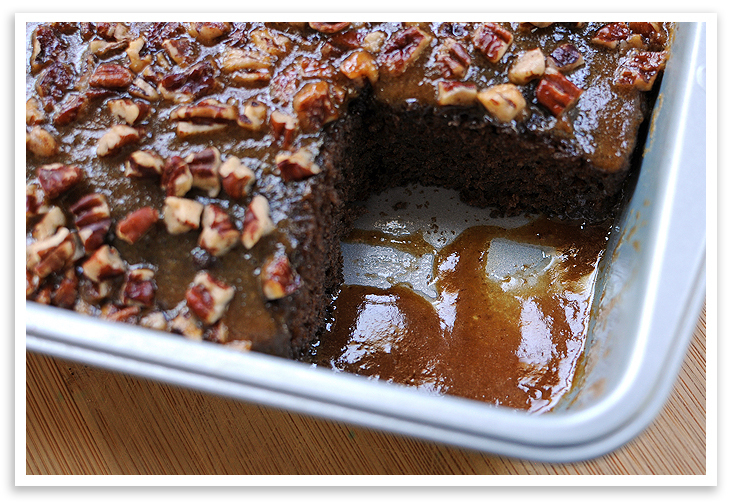 While cake is baking combine icing ingredients, except for pecans, until smooth. 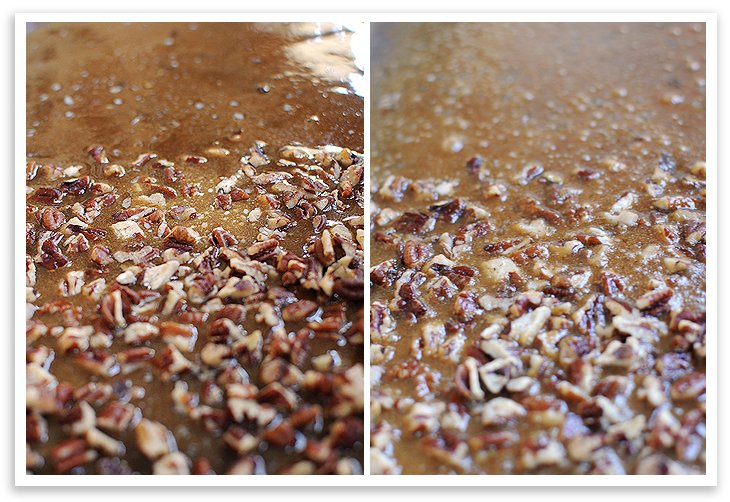 As soon as cake is done, spread icing on top, and sprinkle with pecans. Switch oven to broil. 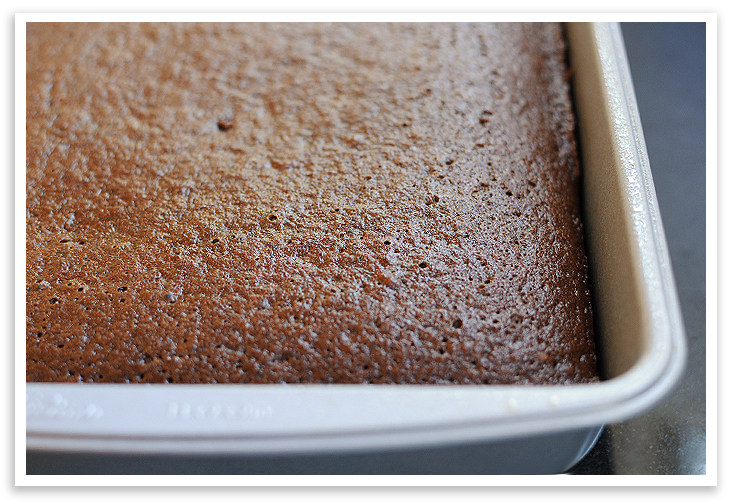 Return cake to bottom rack of oven, and broil until icing bubbles (about 4-5 minutes). Watch carefully. When icing bubbles, remove from oven, slightly cool, cut in square and serve. Wow, this looks fantastic! 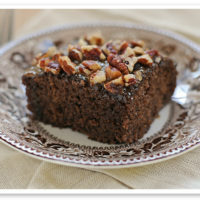 I have some pecans that I need to shell and this is what I will be making with them! These look highly addictive. Definitely something to wake up and eat at 3am! I am seriously dying the most beautiful praline cake square death right now. You know, I have everything but the evaporated milk and pecans? I’m running to CVS right now. I NEED to make this cake A.S.A.P. You had me at praline. That looks so good. And how wonderful that it’s a family recipe! This is the perfect dessert for a Sunday night when you are craving something sweet. Love it!! Ummmm yes please?! These look simply scrumptious! Oh that icing! I just want to eat it by the spoonful. these look so rich! i love them. That looks like the perfect cake! That part on the bottom? Oh baby! Oh yum! I love the butter pieces in the icing that melt right in….umm, yes! i think i would seriously just lick the bottom of the pan clean, burned tongue and all! What a beautiful dessert Amy.. I am always inspired by you! Thanks! Now all I want to do is go make cake…well, and eat cake. Have a great weekend! Oh Amy you’re killing me girl! this looks and sounds amazing! I have never had a cake quite like this one but it certainly looks delicious. I’m copying the recipe. Thank you. The gooeyness of this is so seductive. I wish I could come over and have one! Looks absolutely delicious. A bit like Sticky Toffee Pudding in a cake bar. Now my mouth is watering just looking at this cake! Could sure eat a piece of this right now. I love the name of your blog “she wears many hats” I often feel the same as well, that said, WOW, it really is such a masterpiece, the cake looks so moist. HA! ANYTHING with Chocolate in it and I’m there! GREAT photos! That’s giving a gooey feeling of this elegantly prepared darky cake. I would love to follow every steps on this. Could this recipe get any better? oh wow Amy – this is my kinda cake! I think I need to come visit you for a big piece of this cake! YUM!!! Ummm, thank you…my day is now moving in the right direction. I think everyone should start their week off with this recipe. Looks delicious! The next time my roommates start to look at me all funny for baking five cakes in a row, I’m going to direct them to this post. Obviously, I NEEDED to do it! And now I’m going to NEED to make this cake. that praline glaze on top looks amazing! 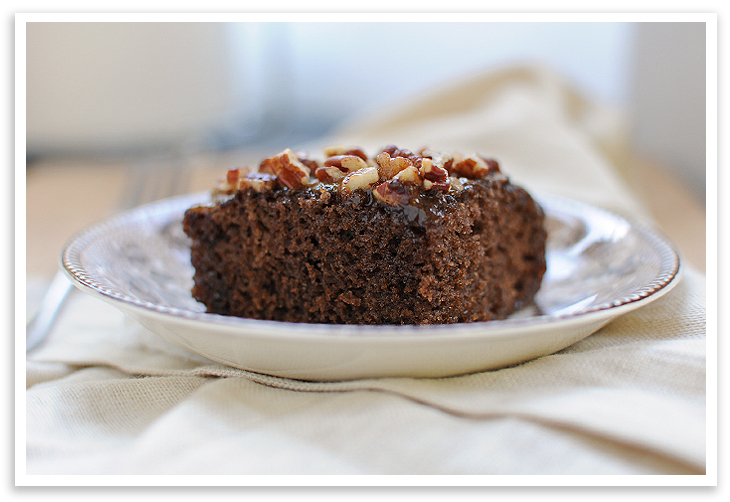 Praline, what a great addition to the flavor of a brownie. Being a native Texan, pralines are a common treat, and definitely one of my favorite. I’ll bet that flavor is great in a brownie. I’m sold, and I’m trying it! This cakes looks fabulous and I love the plate that you paired it with. Very nice! I can’t wait to try it. Hey… I was wondering… if the frosting melts into the cake… and you can’t really see it…. does it have calories? Oh, good! I didn’t think so. This is my weekend tailgating snack! Holy Chocolate Cake Batman! Wow! I honestly think I could sit with a spoon and eat a coffee cup full of the icing by itself…..
Could not look more delicious. I forgot to put eggs in, it was still one of the best desserts I have ever made. Glad it turned out for you! It’s one of my favorite cakes for serving a group.